Stems medium thick up to 0·5 mm. in diam. Inflorescences rather loose to dense cymose and subglobose clusters. Flowers 2–3 mm. long and broad, accrescent in fruit, often somewhat glandular, subsessile, often obpyriform in fruit. Calyx about as long as the corolla tube; lobes broad, ovate-circular, obtuse, not overlapping. Corolla campanulate; lobes rounded, obtuse or somewhat triangular but blunt, shorter than or as long as the tube, erect to somewhat spreading. Stamens shorter than the corolla lobes; filaments usually very short and stout, more or less subulate; anthers broadly elliptic to subcircular. Scales shorter than the tube, reaching nearly to the base of the filaments, much fringed apically, not bifid or variously bifid sometimes consisting of one fringed lobe on either side of the area of the corolla tube below the filaments. Ovary globose; styles stout, shorter than the ovary, divergent and intrastylar aperture large. Capsule globose or somewhat obpyriform, not splitting at base; intrastylar opening 1–1·5 mm. long, often almost circular. Seeds ellipsoid to ovoid up to 1·5 mm. long. Stems fairly slender, up to 0.5 mm. in diameter. Flowers about 2 mm. long and broad (up to 3 mm. in fruit), arranged in rather loose to compact cymose clusters; pedicels shorter than the flowers. Corolla-lobes rounded, obtuse or somewhat triangular but blunt. Stamens short up to 1 mm. long; filaments usually very short. Scales reaching nearly to the base of the filaments, much fringed apically, not bifid, slightly bifid or completely bifid and then consisting of one fringed lobe on either side of the areas of the corolla-tube below the filaments. Styles about 0.5–1 mm. long, divergent. Capsule globose, not splitting at base, drying a reddish-brown colour; intrastylar opening 1–1.5 mm. long, often almost circular. Seeds about 1.25 mm. long. In East Africa parasitic on swamp vegetation, e.g. 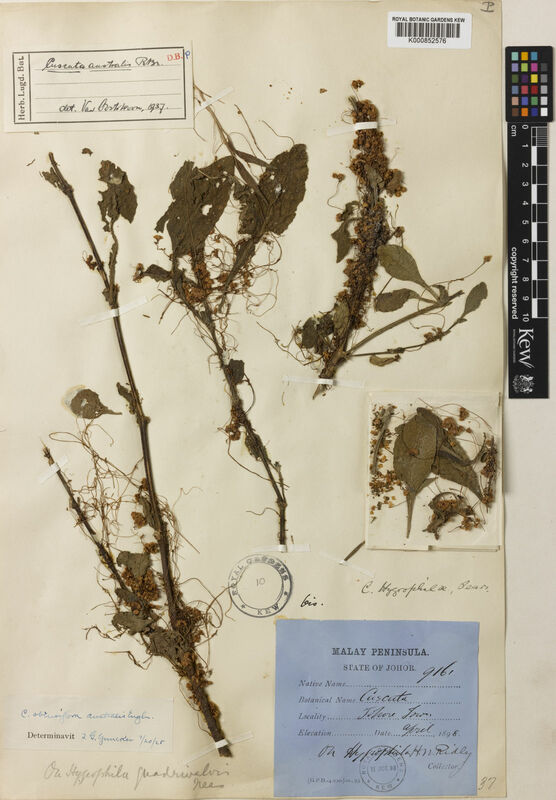 Hydrocotyle and Polygonum, also on Glinus; 960–2100 m.
Cuscuta australis var. cesatiana (Bertol.) Yunck. Cuscuta australis var. tineoi (Insenga) Yunck. Costea, Mihai in Costea, M. (2011). emailed list of name & status changes Personal communication from M. Costea via email 15 Oct. 2011 re: name & status changes in Cuscuta. Yuncker, T.G. & Rechinger, K.H. (1964). Cuscutaceae for Flora Iranica Flora Iranica 8: 1-16. Naturhistorisches Museums Wien. Meeuse in Bothalia 6: 647 (1958). Meeuse in Bothalia 6 : 647 (1958). Verdc. in E. Afr. Agr. Journ. 18 : 85 (1953). Yuncker in Mem. Torr. Bot. Club 18 : 124, fig. 1 (1932). R. Br., Prodr. 1 : 491 (1810).